At Dental Associates of Delaware, our Brandywine, Middletown and Hockessin dentists, in addition to providing outstanding family and cosmetic dentistry, are proud to offer reconstructive dentistry services such as dental implants. Despite improvements in dental care, millions of Americans suffer from tooth loss – mostly due to tooth decay, gingivitis (gum disease), or injury. For many years, the only treatments options available were bridges and dentures. Today, however, dental implants are available. Anyone missing teeth is a candidate for dental implants. 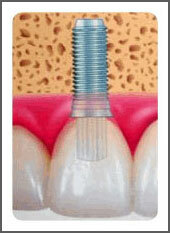 Dental implants can accomplish the replacement of a single tooth, multiple teeth, or an entire dental arch. They can increase chewing comfort by providing retentive anchors for full or partial dentures, and eliminate the use of denture adhesives. Technology has advanced to the point where dental implants are commonly used to improve not only your physical well being, but also the quality of your life. Our Middletown, Hockessin and Wilmington, DE family dentists utilize implant teeth that look, feel and function in a manner that allows you to forget you have implants. Others will not know you have implants unless you tell them. The entire dental implant process, from evaluation to completion, generally occurs over six to eight months. During this time, most patients do not experience any disruption in their normal business and social activities. Dental implants have opened the door to the future in dentistry and oral rehabilitation. Patients who have had to compromise their appearance, chewing functionality, and nutritional intake due to complete or partial loss of teeth, can now be restored back to normal appearance and function. Many patients rediscover the excitement of an active lifestyle shared with family and friends through a renewed confidence to eat, speak, laugh and enjoy life. A thorough evaluation by our Hockessin, Middletown or Brandywine, DE dentists will help determine whether an implant is right for you. Contact our Wilmington/Brandywine office, Middletown office or Hockessin office today for more information on dental implants or to schedule your first visit with us. We look forward to seeing you and helping you achieve a beautiful, healthy smile!